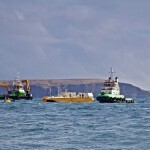 Founded in 2008, Wello Oy is a Finnish company dedicated to the development of wave energy converters (WECs). 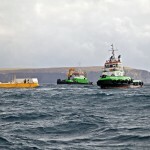 Having worked on a number of wave energy concepts since 1976, the unique Penguin model was selected in 2008 for further progression. A number of scale models of the Penguin have been built and tested successfully in laboratory and at sea, throughout which time the prototype devices gradually increased in size until the current 500kW model was developed. 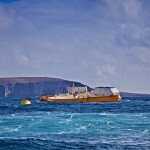 The 1600-tonne Penguin device is around 30 meters long, nine metres in height and has a draft of around seven meters. Only two meters are visible above the water surface. 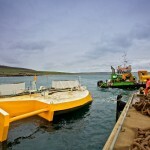 The device first arrived in Orkney in June 2011 and was first deployed at the Billia Croo wave test site in Summer 2012. The Penguin was reinstalled at Billia Croo in March 2017 as part of the Horizon 2020 funded Clean Energy From Ocean Waves (CEFOW) research project coordinated by Fortum. The Penguin remained on site for over two years, surviving numerous storms including wave heights of up to 18.7 m experienced during storm Caroline.